Students in the kindergarten and first grade multi-age class of Debra Blume and Jody Fox learned by digging in the dirt, so speak, when they walked to Gunn Park in the Village of Edwardsburg in October to plant bulbs that will bloom in late fall and early spring. Accompanied by the teachers and parent volunteers and armed with 800 bulbs, the project was a hands-on learning experience to correlate with the science and social studies curriculum. 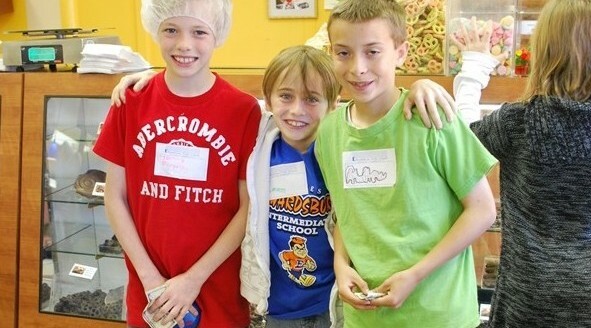 By volunteering their time, the students learned to develop their understanding of good citizenship while raising their awareness of the community around them. 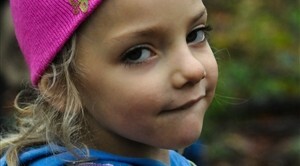 Students are revisiting the park throughout the year to observe changes. Photography is providing references as the teachers are able to use the experience to teach reading, writing, and mathematics. Additionally, the children are learning that the project can provide them with a place to read and journal beyond the classroom. Students in the kindergarten and first grade multi-age class of Debra Blume and Jody Fox walked to Gunn Park in the Village of Edwardsburg to plant bulbs that will bloom in late fall and early spring. 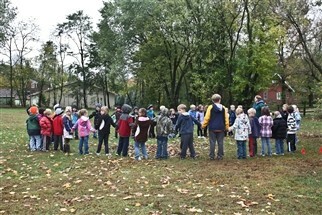 All of the kindergarten classes of Diana Lung, Ashley Henderson, Jessica Venhaus and Tabitha Heiermann traveled to Cass County’s Russ Forest in October 2011 as part of an education grant awarded for the project. The project combined the social studies and science curriculums and touched on everything from different types of woods, trees and leaves, to how the seasons change and how this affects people and animals preparing for winter. Students, lead by the teachers and accompanied by parent volunteers, collected leaves, discovered animal tracks, observed animal homes, and experienced the natural environment of the falling leaves and cooler weather. 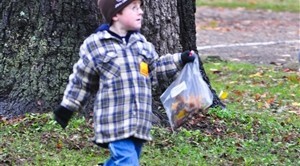 They collected ‘forest treasures’ to use in the classroom. Upon their return in the afternoon, they used their collections to spray-paint designs on individual t-shirts that they were given as a reminder of the adventure. 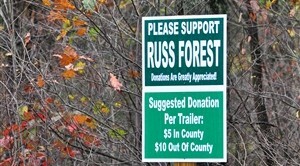 A 2011-12 grant provided a field trip to Cass County's Russ Forest by all the kindergarten classes of Diana Lung, Ashley Henderson, Jessica Venhaus and Tabitha Heiermann. Seven teachers received a grant for the 2011-12 school year to expand their fourth grade students’ understanding of economics. The social studies curriculum requires that students deepen their knowledge of economic principles while studying market economics. Visits to two area businesses, one involved with communications, the other a producer of goods, were developed to help that learning process. During a field trip to the WSBT stations and the South Bend Chocolate Factory, students in both single and multiage classrooms compare and contrast the similarities and differences. Additionally, materials from the school library and a classroom textbook enhance the learning experience. Three completed activities by students also allow them to demonstrate their individual understanding. Teacher Applicants: Lisa Jacobson, Melissa Ryker, Janie Williams, Nancy Tighe, CindyVernon, Lisa Wills, and Marcia Harroff. Seven teachers received a 2011-12 grant to expand their 4th grade students understanding of economics. 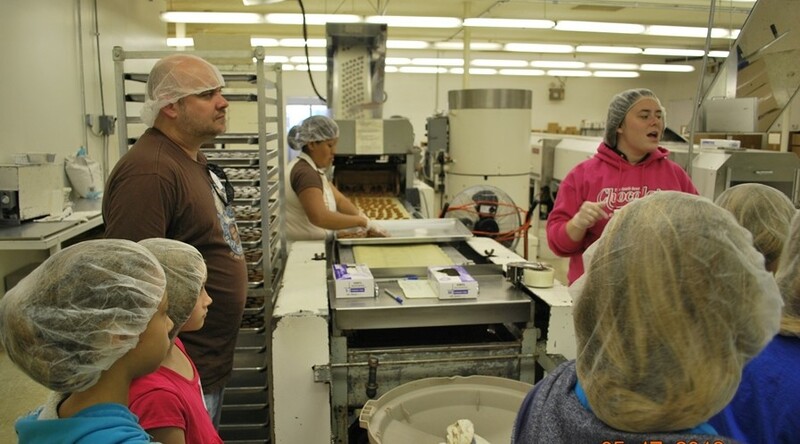 They took a field trip to the WSBT stations and the South Bend Chocolate Factory. A grant that pays for a New York Times publication of non-fiction, informational reading is allowing the English and social studies departments at Edwardsburg High School to provide students with a more well-rounded approach to learning. The publication, which is intended to address several skills expected of high school juniors for college readiness and mastery of the ACT and MME exams, is used in the junior-level classes taught by Lisa Emenaker and Jennifer Wyant. Those skills include reading, writing, critical thinking, analysis, vocabulary acquisition, the understanding of primary sources, and research practices. The New York Times Upfront Teen Magazine is a professional combination of a proven educational track record from Scholastic and award-winning journalism from The New York Times. Teachers expect that through its use, they will see high interest engagement and achievement from students. The grant provides for 40 copies of the magazine for 14 issues during the current school year. A program that stressed healthy choices and positive growth experiences was funded for six Mondays after school in the winter for fourth and fifth grade girls. Entitled “Girl Power Counseling Program,” the project was implemented by Leslie Ostrander, behavioral services coordinator, and Linda Kozlowski, primary teacher, and specifically focused on self-esteem, body image, career development, friendship and communication skills, physical fitness and nutrition. The project was intended to help girls ages 9 to 11 make a smooth transition from childhood to adolescence by helping them understand the importance of making healthy decisions as they grow. The program is aimed at targeting girls at an age when their self-esteem becomes too closely tied to physical attributes. The Girl Power curriculum originates from the U.S. Department of Health and Human Services. 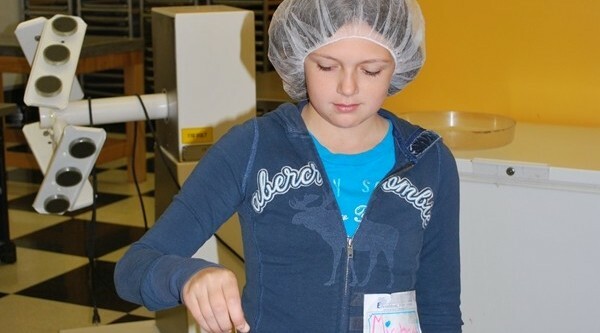 Girls participating in the program used what they learned to provide mini lessons to other fourth and fifth grade students at the Edwardsburg Intermediate School.